I've been learning a lot lately about this interesting herb. Ashwagandha is a member of the nightshade family, however it should be noted that that unlike other nightshades, Ashwagandha lacks the poisonous attributes. Typically found and cultivated in India, Ashwagandha has been popularly applied to those with overworked and often hyper-tense lives. Ashwagandha is India's native answer to Ginseng and it is currently being applied in Ayurvedic medicine to treat hypertension and stress related ailments. Recent studies have attempted to popularize its use as a preliminary treatment for male infertility and impotence problems. I am drawn to the flavor. It's sweet and woody with a slightly bitter aftertaste. It's being studied for it's possible use in treating thyroid disorders - especially auto-immune related ones. 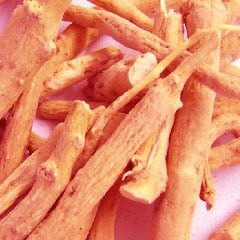 "Ashwagandha root (Withania somnifera) – Bitter, sweet, warm, dryWestern Classification: Adaptogen, anti-inflammatory, antioxidant, antispasmodic, astringent, immuneamphoteric, sedative (mild).This herb is one of the Rasayana (rejuvenative) herbs of Ayurveda. It is one of the few calmingadaptogens and has traditionally been used for anxiety, bad dreams, mild OCD, insomnia, and nervousexhaustion. It acts as an antispasmodic & anti-inflammatory and is very useful for fibromyalgia (with Kava and Scullcap), restless leg syndrome, mild Tourette’s syndrome, and osteo-arthritis. It is animmune amphoteric useful for hyper- and hypo-immune conditions. I find it especially useful for autoimmune conditions affecting the muscles and joints such as rheumatoid arthritis, AnkylosingSpondylitis, polymyositis, and polymyalgia rheumatica (PMR). It enhances male fertility (sperm countand sperm motility) and, due to its iron content, it benefits iron-deficient anemia. Ashwagandha also stimulates thyroid function. Studies in mice showed significant increases of serum T3(18%) andT4(111%) after 20 days of use8." I've been using some Ashwagandha Extract for about a week and I do feel an increase in energy and clearer thinking. Please share your experiences with this wonderful herb.